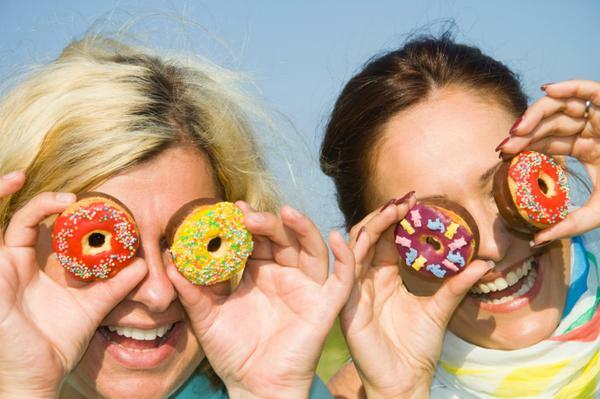 Emotional Eating and Food Addiction Do your friends do it? 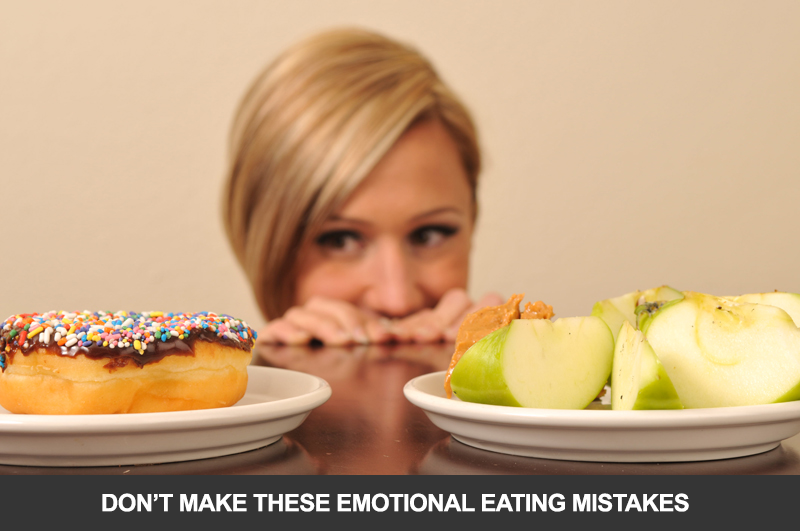 Do You Know Someone That Makes These Emotional Eating Mistakes? Are your friends emotional eaters? Over my many years of being in the fitness industry and working with individuals from all walks of life, I’ve seen women struggle with emotional eating and food. The truth is that the majority of women do, at one point or another, battle at least one of what has become very normal (but not necessarily healthy) eating patterns. Some learn to work around emotional eating, and others, sadly, never do. Since I’m well aware of the effects of emotional eating on women I wanted to try offer some steps we can all use to learn how best to deal with any emotional eating tendencies. I believe it all stems from our nature as women to need immediate comfort. The majority of the women with whom I’ve worked have, at one point or another, dealt with emotional eating relationships with food and made it clear that food is comfortable and does not judge. Millions of women around the world are emotional eaters and while it isn’t necessarily anything out of ordinary and definitely not something to be ashamed of we still need to keep our health in mind. Get to know yourself. Be patient. You deserve it. Ideally your primary reason for consuming food should be to provide it with fuel. If you’re eating for reasons other than that, you’re most likely eating for emotional reasons. Every time you’re “craving” chocolate, chances are, you’re craving the comfort that comes along with eating it. That’s an emotion; it’s your body’s response. Whether stress, loneliness, happiness, sadness, anxiety, or even boredom, many people get into the habit of emotional eating as a response to numbing something they are feeling. If you can learn to alter your response to various feelings, you can break the cycle. Is it easy? NO. But nothing worthwhile ever is. How do you know if you are emotional eating? Do you tend to randomly open the fridge and start “picking” at foods when you *just* ate and are in no way hungry? Do you reach for food when you’re bored, feeling stressed, irritated, angry, or sad? Do you have a hard time stopping yourself from finishing the food that’s in front of you, even when you’re stuffed? Do you feel guilty and regretful after consuming your unplanned meal? Can you identify with any of the above? If you can, then you’re not alone — you’re one of the many emotional eaters who consume food to satisfy feelings rather than hunger pangs or the body’s energy requirements. So what if anything can you do? We all go through various stressors, that’s part of being alive. We, as women, are especially prone to undergoing an emotional roller-coaster as we run around taking care of what everyone needs. What about all the natural, hormonal changes we all undergo each month that add fuel to the fire? It’s hard to overcome unhealthy emotional eating habits when there are so many feelings with which to deal. But you see, this is precisely the first step to controlling your habit — dealing with your emotions! You’re so busy taking care of everyone else, that all you have the time to do for yourself is thoughtless eating. Dealing with this less than unhealthy practice is very trying and a long term effort. In the short term simply try asking yourself whether you really need the food you’re about to eat when you’re standing there and staring at it. When you’ve decided that breaking your diet for those cookies is worth it, give yourself ten minutes to calm down and reassess the situation. If you still think it’s a smart decision, go ahead and have a cookie – just don’t eat the whole box. Those treats won’t disappear if you just wait and let your emotions calm down a bit. If you find that you’re bored, get busy doing some other pleasurable, enjoyable activity. Your mind is telling you that you need to occupy it — if it wanted you to eat, you’d be feeling hungry! The minute you learn to refocus, to be patient with yourself, to stop treating yourself with mindless, thoughtless actions, you’ll notice your habits start to slowly shift and the cycle will begin to break. Oftentimes, when asked whether she begins emotional eating due to being an emotional eater, a client will respond by saying that she overeats because she loves food, but that it has nothing to do with emotions. “I love food, so it’s hard for me to stop,” she’ll say. “I enjoy eating tasty stuff, and get carried away — that’s how my whole family are overeaters,” is another variation. Believe it or not, statements like these are another sure-fire way to tell whether food consumption stems from an emotional place. Sure, we all love certain foods, and there is nothing wrong with enjoying treats that taste good to us, but when you’re eating past the point of fullness, as if you’ll never see that food again, you know there’s a problem. It’s never as simple as “I eat because I like to eat,” and admitting that to yourself is the first step to stopping this defeating behavior. Sit down with yourself, and really listen to what your mind is telling you. If you’re emotional eating — whether it’s chocolate, cookies, cake, chicken, or even broccoli — there’s something there to be dealt with. Begin being mindful with yourself, starting today. Take the first step toward a healthy relationship with food, a healthy mind, and a healthy body. Are you your own emotional eating enemy? There’s no doubt in my mind that just about everyone reading this has gone on various kinds of restrictive “diets” in the past, heck we all have at some point. Low carbs, low fat, all “clean,” 4 ounces of protein every 2 hours and nothing but veggies at night… I could go on forever. A million different reasons for dieting exist, and no matter how “healthy” your diet, if it deprives you of comforting foods (ones you consider “favorite”), you will want to indulge at some point. That’s will be absolutely NORMAL. Your should always allow room in your nutrition for foods you enjoy – always! We are after all emotional creatures and beautiful ones at that. If you don’t allow yourself the foods you’ve grown accustomed to consuming, no matter how many times you tell your mind that what you’re doing is best for your body, your body will still feel deprived. Deep down, you’re feeling deprived. Your subconscious mind is convinced that you aren’t getting the kind of nutrition that it needs, simply because it isn’t getting the kind of nutrition that your subconscious mind really wants. Your body can identify the difference between the two, but not your mind — it functions through habit, not logical reasoning. This means that no matter how hard you try to resist those cookies sitting right in front of you, your subconscious will tell you that you need them. This voice will often be loud enough to overpower your logical mind. Depriving yourself from your favorite foods for prolonged periods of time ends up “convincing” your subconscious mind that those foods don’t come around very often. So now, your instincts are telling you that your body not only needs those cookies, but also that they’re a rarity. Of course, your thinking mind realizes that this isn’t so, but in the end, your instincts are stronger. Which is why you soon find yourself eating as many cookies as physically possible, as fast as you can. What happens an hour later? You feel endless guilt about having binged, and either swear to yourself that it’ll never happen again, or just decide that there’s no sense in bothering with trying to lose weight, you’re bound to “fail” again anyway! Once a few days (or weeks) pass, you’re back on the wagon, making yet another attempt… that never seems to end any other way than what’s described above. Take a minute to really let all the above sink in. If it rings a bell with you, how do you think you can stop it? Obviously, if you could just stop depriving yourself, that’d be a start, right? Well, it’s all about moderation. You can even prepare your usual meals in ways that are clean but also delicious! There are so many recipes available online if you search you WILL find something that can even put your favorite dessert to shame. Do whatever you can to prevent yourself from feeling deprived, because once you do, it isn’t a sustainable lifestyle, and you’ll be much more prone to emotional eating. There is nothing more delicious and satisfying than the best body you ever had! This entry was posted in Nutrition and tagged binge, diet, eating disorder, emotional eating, Food. I too can relate to your article on emotional eating. Find right kind of exercise that is both enjoyable for you and that produces the results you want. This is a huge help in stopping the cycle of emotional eating. Working out regularly has so many wonderful benefits physically, emotionally, and mentally. Sometimes it is hard to just break the overeating habit cold turkey. But if you start with the positive and get active, the motivation towards healthy eating will grow!